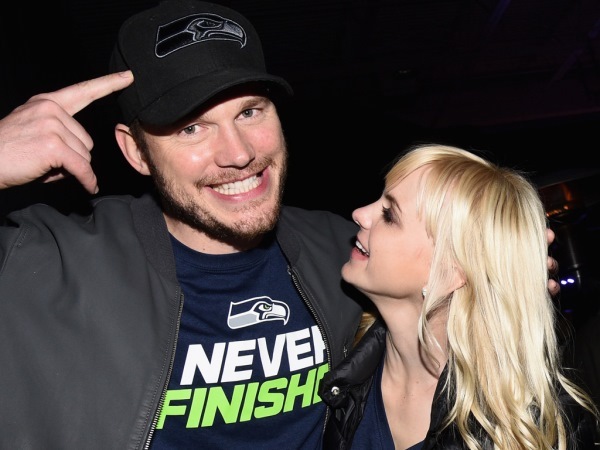 Chris Pratt has described how he and wife Anna Faris were “like magnets” when they first met. The Jurassic World actor has been married to the blonde actress for five years. The 35-year-old admits the attraction was instant, but he never thought that Anna would be his. "It was like magnets," he told Elle.com about when they first met on the set of 2007 film Take Me Home Tonight. "Our personalities meshed, she was a goofball, she liked to have fun, it was impossible to offend her. I just remember thinking, ‘Wow, in another life, that's who I want to be with—we would be so good together, I just know it’." What stood in their way was Anna’s marriage to Ben Indra, who she tied the knot with in 2004. But when the 38-year-old filed for divorce in late 2007, Chris became her shoulder to cry on. In Take Me Home Tonight, the pair played an engaged couple, and getting up close and personal on screen meant it was easy for them to get close in real life when the timing was right. “We had just played love interests, so we had this tight bond spending so much time and spending nights in Phoenix, but we never crossed the line,” Chris added. “But we were, I think, developing feelings for each other at the time, you know? The day that she told me she was leaving her husband, I knew that I was going to marry her." The couple became engaged two years after getting together before their nuptials in Bali in 2009. They now have two-year-old son Jack together.